Generally, atmospheric air contains moisture in the form of water vapour. When the air cools down, it becomes increasingly unable to hold this moisture and the density of saturated water vapour decreases. As a result, the relative humidity increases and when it reaches 100%, the air gets saturated. When this air continues cooling down, the moisture turns into condensation. In most buildings, condensation usually happens when moist air comes into contact with relatively cooler surfaces, such as window panes. 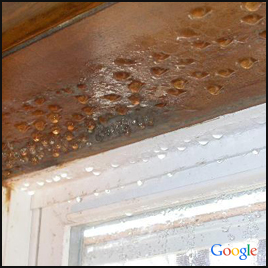 Condensation can also occur interstitially, arising between multiple layers of walls. This usually happens due to air diffusing from the warmer interiors to the cooler exteriors, touching its dew point within the structure. Effective condensation control can also prevent a range of other damp issues. Our vast experience helps us spot condensation on walls and ceilings before it becomes severe.